Hopewell Township, N.J., just passed a new ordinance that regulates when chickens and roosters can hook up in backyard henhouses. The roosters of Hopewell Township, N.J., are going to have to learn a little restraint. The town just passed a new ordinance that regulates when chickens and roosters can hook up in backyard henhouses, according to the Associated Press (AP). 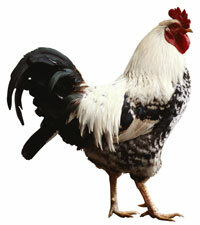 Under the new chicken-scratching law, roosters would be allowed only 10 days a year to sow their wild oats. The birds also must be disease-free and they better not crow about their conquests — they are not allowed because they’re too noisy, according to AP. Any roosters that crow too long can be banned from the property for two years. Hopewell Township residents can have up to a half-dozen hens on half-acre lots. Mayor Jim Burd says the new ordinance is a compromise between today’s lifestyle and the township’s agricultural history.